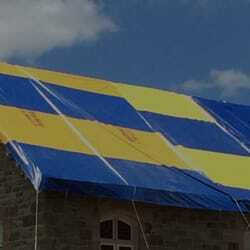 All our tarps are high grade and heavy duty. And they come in sizes that’ll cover small rooms, entire football fields and everything in between. Chances are if you need a tarp you need it fast. Whether you’re battling to keep the elements out of your house or off your brickwork, Flynn it and you’ll win it. We offer a Same Day Service, and aim to get your tarp to you within 3 hours. As Australia’s tarp specialists, we take pride in a job well done, and give every customer the best, most personalized service. Small wonder so many give us great reviews, and spread news about our quality via word of mouth. We know you’ve got a budget to stick to, which is why our pricing is so competitive. Don’t waste time with expensive general hire companies who probably don’t know their tarps from their tools. Trust the specialists here at Flynn Tarp Hire.